Sorry about this late post -- was out all day yesterday. The MoD has ordered an inquiry into allegations that emerged last year in the Italian press (and then yesterday in The Indian Express) that Finmeccanica used corrupt practices to win a $700-million deal signed in Feb 2010 to supply 12 AgustaWestland AW 101 helicopters (image in IAF livery) for VVIP transport to the Indian Air Force. In 2008, MAIL TODAY broke a story about how India's apex Cabinet Committee on Security had cleared the deal despite deviations in tender parameters. The Finance Ministry too reportedly objected to the deal, but was prevailed upon to approve it in the end. Days after the deal was signed, Sikorsky executives told me they would protest the decision, but only ended up writing a letter to the MoD asking for details of why the S-92 was rejected. While only investigations will establish if kickbacks were paid and if so, to whom, my limited point for the moment is that the efficiency and alacrity with which the government pushed through the VVIP helicopter purchase was unusual -- the sort of thing totally lacking in the purchase of anything for the armed forces. 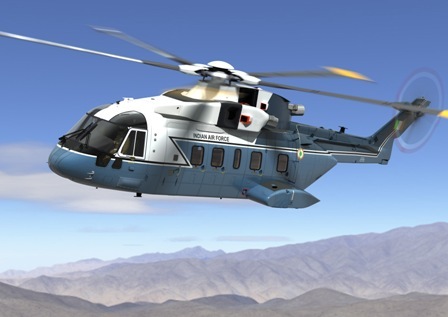 The AW 101s, the first of which are set to arrive later this year, will be operated by the IAF's Delhi-based Communication Squadron, and used for the executive transport of the President, Prime Minister, Cabinet Ministers and visiting VVIPs.